Power2Peer is excited to announce that under the supervision and guidance of Power2Peer founder Dr. Nish Sonwalkar (ScD, MIT), the Power2Peer software team has successfully created a blockchain-secured trading platform. P2PConnect combines the latest blockchain technology with artificial intelligence, IoT (Internet of Things) devices, big data analytics, and solar microgrids, integrated in one easy-to-use mobile application. Alongside the proliferation of the adaptive solar microgrid, P2PConnect could empower millions of solar producers and consumers who wish to buy and sell solar power directly. P2PConnect allows customers to register as either consumers, producers, or prosumers, depending on how they wish to participate in the energy marketplace. Equipped with Powe2Peer’s advanced analytics software and live communication via IoT devices, the app will find consumers the best price for clean energy, while connecting producers via microgrid and blockchain-secured trading platform to an entire community of consumers willing to purchase clean solar power. 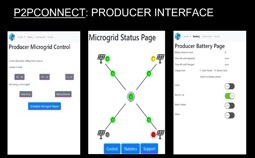 Prosumers utilizing P2PConnect to efficiently manage both their excess generation and peak load energy sourcing will be able to achieve 100% sustainability through resilient solar microgrids. Because P2PConnect’s platform is blockchain-secured, all energy transactions are recorded and verified using a secure ledger, allowing consumers and producers the freedom to safely and efficiently exchange renewable energy. Through blockchain smart contracts, customers will be able to set parameters which will then greenlight automated transactions based on preferred terms of price, quantity, and availability. As the solar microgrid community grows and gains traction, Power2Peer’s SDN (software defined network) will connect customers to an ever-expanding network of microgrids, powered both by solar and other connected sources of renewable energy. Though each local microgrid is resilient and functional on its own, connecting to other microgrids will further enable P2PConnect to find buyers and sellers the most favorable energy prices. The Power2Peer software team is now beta testing P2PConnect’s efficacy in managing the entire value chain of energy transactions. The success of the blockchain platform dovetails with the advancement Power2Peer’s engineering team has made in connecting the software defined controller with the multigrid solar microgrid hardware. Stay tuned for more updates and the release of P2PConnect for iOS and Android! 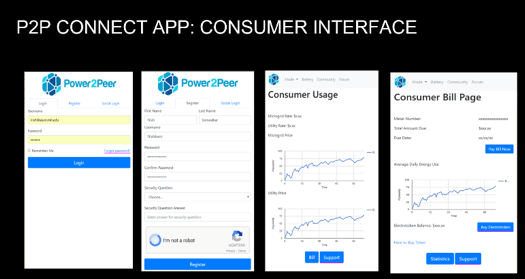 *The consumer and producer interfaces shown here are copyright protected by Power2Peer. All rights reserved.